Last week Vivo launched a new smartphone Vivo V7+ in India. The biggest feature of the phone is its front camera. It is a selfie centric smartphone with a 24-megapixel camera at front. With the launch of Vivo V7+, it will be a tough competition for Oppo F3 which is also a selfie camera-centric phone. Here is the full comparison of both selfie centric phones – Vivo V7+ and Oppo F3. Coming to price comparison of Vivo V7+ and Oppo F3, the price of Vivo V7+ in India is Rs.21,990 and the price of Oppo F3 in India is Rs.19,990. The sale of Vivo V7+ starts in India from 15 September in India. Oppo F3 smartphone was launched in India in the month of May and is available to buy in all stores. Vivo V7+ biggest feature is its front camera. the phone comes with a front camera of 24 megapixels while on the other side Oppo F3 comes with a dual front camera of 16 megapixels and 8 megapixels camera. The front camera of Vivo V7+ comes with moonlight Glow flash to click a perfect selfie. The front camera of Oppo F3 comes with various features like Beautify 4.0 app, Selfie Panorama, Screen Flash, and Palm Shutter. 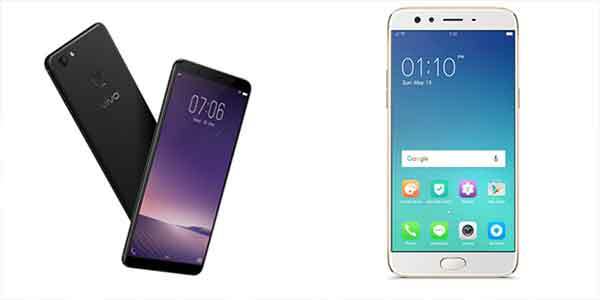 Coming to the software comparison of both Oppo F3 and Vivo V7+ selfie centric phone, the newly launched Vivo V7+ smartphone runs on Android Nougat operating system 7.1 and Oppo F3 runs on Android 6.0 Marshmallow OS. Vivo V7+ comes with Funtouch OS 3.2 based on ANdroid Nougat and Oppo F3 comes with ColorOS 3.0 based on Android 6.0. Display Comparison – The new smartphone Vivo V7+ comes with a display of 5.99 inches. the resolution of the screen is 720×1440 pixels. While Oppo F3 comes with a display of 5.50 inch. the resolution of the screen of Oppo F3 is 1080×1920 pixels. Vivo V7+ comes with Full View display with 18:9 aspect ratio. The display of Oppo F3 is protected by Corning Gorilla 5 protection. Processor & Android Comparison – The processor of Vivo V7+ is octa-core Qualcomm Snapdragon 450 SoC and it runs on Android Nougat OS. Oppo F3 is powered by a 1.5GHz MediaTek MT6750T6 octa-core SoC. the phone runs on Android Marshmallow operating system. Camera Comparison – The rear camera of Vivo V7+ smartphone is 16 megapixel and the front camera of the phone comes with a 24-megapixel sensor. While in Oppo F3 there is a dual front camera and comes with comes with a 16-megapixel sensor and 8-megapixel camera. The rear camera of the phone is 13 megapixel. Battery & Other Feature Comparison – The battery of Oppo F3 smartphone is 3200mAh. Other Features of the phone include Wi-Fi, GPS, Bluetooth, USB OTG, FM, 3G, and 4G. the battery of Vivo V7+ smartphone is 3225mAh. Features include Wi-Fi, GPS, Bluetooth, USB OTG, FM, 3G, and 4G.